The welfare state is unsustainable economically, socially and morally. Church leaders want benefit levels raised. Do they also want to see benefit numbers grow? Because that will be one result of lifting benefit payments. Various US studies have shown a percentage rise in welfare payments equates to an equal or greater percentage rise in beneficiary numbers. It stands to reason. People on benefits weigh up the costs of working compared to being on welfare. The smaller the gap between working and welfare, the more likely they are to choose the second. Another important consideration is the effect of welfare on children. American Robert Rector summed it up well when he said, "Higher welfare payments do not assist children; they increase dependence and illegitimacy, which have a devastatingly negative effect on children's development." In New Zealand it is estimated around 5 percent of families with children are in trouble. That is, they are affected by domestic violence, alcohol and drug abuse and addiction, and excessive gambling. These problems lead to enormous economic stresses. Many are reliant on welfare (although there is often male with income from work on the scene but not pulling his weight.) Raising benefit levels for these families will not improve their situation. On the other hand, it is also clear that a good percentage of people on benefits are managing. In 2007 55 percent of people on the DPB were in debt to Work and Income. Forty five percent were not. On other benefits the level of indebtedness drops. Because the church social workers are dealing with the grinding everyday slog of beneficiaries scraping by (for whatever reason) their reaction is to solve the problem the quickest and easiest way. Get government to pay them more. But we all know that easy solutions are not usually effective or lasting. It is deeply troubling that these church leaders now seem to be out of step with what government has being trying to do - albeit with limited success. The best income- earning potential must come from working. That is why the In Work payment was introduced. New Zealand's big economic problem is low productivity. That is why we are in a poor comparative position internationally and why so many are leaving the country. Higher wages and better skilled people will not come from making benefits more attractive. The churches need to look at the bigger picture and longer term. New Zealand enjoyed its greatest prosperity when very few people were dependent on welfare. Before the decline of the two-parent family and widespread resort to welfare as a long term option. Increasing welfare payments would ironically have the opposite effect from that the churches expect. They would find even more people lining up for their services. That is surely not what they want. No normal human being wants to see people suffering. Neither do they want to increase suffering inadvertently. The church is virtually bribing politicians emotionally by inferring increasing benefit levels is the only "just and compassionate policy." They are wrong. Perhaps this is a good example of when politics and religion shouldn't mix. Just putting this comment from Lindsay Perigo on record here. One great thing about Sir Roger, as I argued recently, is that he's a conviction politician. But his convictions are not libertarian. If anything, Roger's return opens things up even more for Libz. Rodney's born-again soft-cockery and Roger's compulsionism mean the chasm between Libz and ACT is greater than ever. We are unique. And no way will ACT get 130,000 votes. They'll be lucky to get 30,000. 130,000 votes based on 2005 results is about 5.7 percent - 30,000 around 1.4 percent. I won't be making any predictions about whether the Libertarianz can get any more than the 946 votes they received in 2005. And now for something completely different. I'm a big fan of the UK version of The Apprentice with the acerbic Sir Alan Sugar. For some reason he has always seemed vaguely familiar to me but having spent a lot of time around East-enders I brushed it off as a generic thing. Then I was reading this very entertaining interview and discovered he flys planes. Flys planes and he comes from Hackney? In the late eighties and early nineties I was learning to fly at a North East London airfield called Stapleford. To pay for my lessons I would work in the bar/restaurant during the weekends. It was pretty much my life for a number of years. So I searched Alan Sugar Stapleford and sure enough, he has a plane based there. I probably served him the odd pint or two. But I never got to fly his plane. Unlike other nouveau riche East-end lads who were always happy to let a young barmaid with her pilot's licence at the controls. They were good times. The health and welfare of aboriginal children in the Northern Territories continues to come under the spotlight. Here's a man with a new (old) idea about what is needed. Remote indigenous communities in the Northern Territory need missionary-style dormitories to make sure children are fed, clothed and clean, according to the territory's most powerful Aboriginal leader. Galarrwuy Yunupingu says a return to mission-style days is needed because thousands of children are still going without breakfast nine months after the $1.5 billion federal indigenous intervention began in the territory. Community-run dormitories with cooking, showering and sleeping facilities should be built near schools, he told The Age. "The missionary days were good. 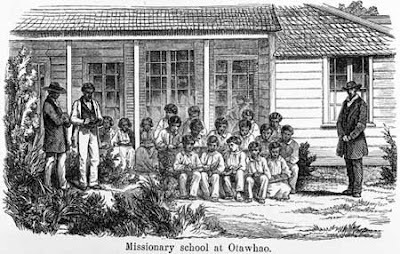 The missionaries looked after the kids much better than the Government does today." Perhaps a similar idea could work in some of our most isolated and dysfunctional communities? Another full house for ACT at the Museum Hotel last night. It was SRO shortly after I arrived to take what looked like the last available seat in the front row. Being in the front made it difficult to assess the crowd size but I think easily over 100 people came to hear Roger Douglas. There were many faces unfamiliar to me and some I did know who hadn't been near ACT in years. Roger and John Ansell expanded on what they had delivered at the conference and it is clear they are very much enjoying their work and growing in both confidence and expectation. It is infectious. Roger again brushed aside the label of 'hard right' reminding us that his old electorate was Otara. When people died on waiting lists it wasn't the 'rich'. It was his constituents. He is determined to make access to operations for all people a reality. His plan (although not official ACT policy) includes a tax-free threshold of $30,000 with the saving going into an individual health insurance policy. Yes, it's a big idea. But the state of the public health service is a big problem. No, it still doesn't remove the government completely because they are controlling the funding through taxation. But that's where the control stops and the market steps in. Yes, the bogie of compulsion rears its head again. I am not going to ignore that. But some time ago I conceded this; I would rather be compelled to pay for myself and my family than compelled to pay for someone else. It's not a matter of being selfish. It's about getting the incentives right. We have seen the results of 70 years of socialised welfare and health and it is not a pretty sight. More synchronicity from National and Labour. This time in the form of Richard Long, prominent Key supporter and Michael Cullen. "The return of Roger Douglas. You have to admit to a touch of nostalgia. The architect of the 80s reforms suddenly looms. Dracula-like from what everyone assumed was a retirement grave...."
"Just when everybody thought it might be safe to vote National out of the box, like something out of an old horror film, comes Roger Douglas." Arguably the most important thing Roger's return has achieved is to show up the National Party for what it is. Labour with a different leader. At best a variation on the 'muddle-way' theme. National MP Judith Collins made a calculating error, according to Minister for Social Development Ruth Dyson. She took total the total number of beneficiaries in debt and divided it by the total number of working-age beneficiaries. Dyson labelled this 'New Maths'. Dyson prefers to count in superannuitants, of which there are around half a million, even though the vast majority have no debt to Work and Income. The predictable result is that the percentage of beneficiaries in debt is a modest-looking 19.8 percent. In reality the number of working age beneficiaries in debt is almost half. On the DPB it rises to 60 percent. Dyson's creative maths is more devious and dodgy than Collin's 'New' maths even if it is statistically correct. Comments are not moderated but will be deleted if they are abusive. Non-deletion of comments does not imply approval or agreement with the sentiments expressed. Lindsay Mitchell has been researching and commenting on welfare since 2001. Many of her articles have been published in mainstream media and she has appeared on radio,tv and before select committees discussing issues relating to welfare. Lindsay is also an artist who works under commission and exhibits at Wellington, New Zealand, galleries. Utopia - you are standing in it! When Did the Blacksmiths Disappear? Corporate social responsibility – is it socialism by the back door? What does the public really think about a capital gains tax?